A couple of weekends ago, a great family friend had a wedding shower at Peek n Peek resort. She’s a great cook, so it was an interactive shower complete with cooking stations and demos. I was asked to make her a special apron for the day and while looking for inspiration I thought, why not be inspired by a wedding dress. I wanted it to be lacy and sparkly and have all the romantic flare of something fancy while still being practical. I know what you’re thinking… that it’s way too nice to cook in, but I think that’s the best part. I like the juxtaposition of super fine materials being used to create something that’s typically meant to get dirty! Start off by cutting a muslin piece to serve as the foundation for the apron. I left the sides unfinished to give it a vintage-inspired look so the size you cut the foundation will stay the size of the actual apron. 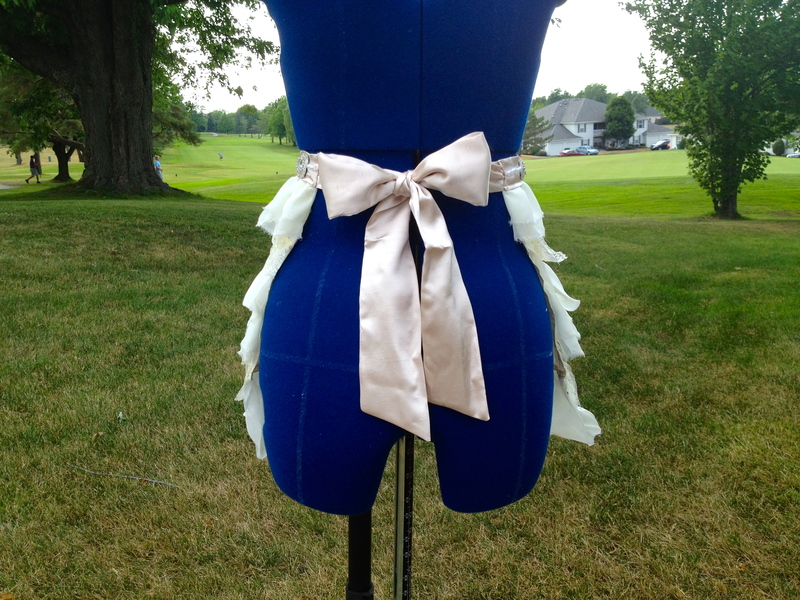 Measure out the center front point, mark with an X and pin the muslin to your dress form at the waistline. 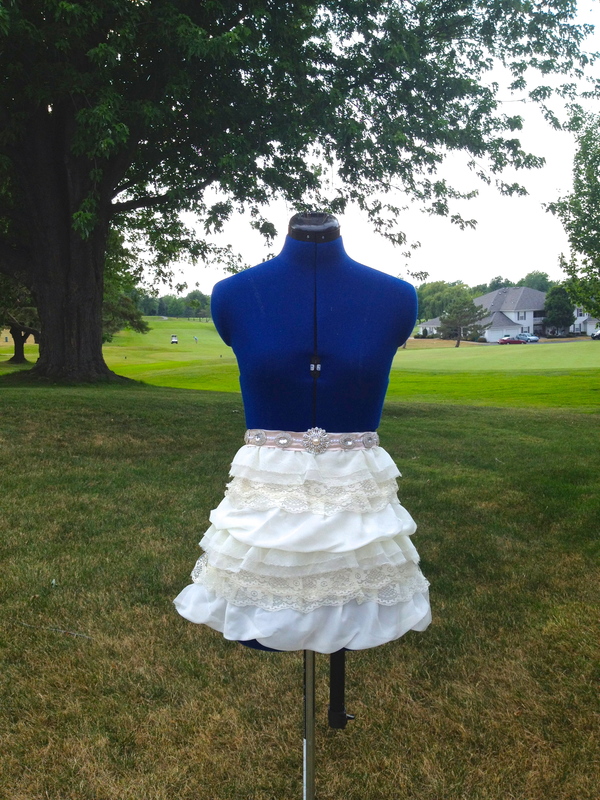 The apron is layers of fabric and trim overlapped to create a full “ruffled skirt” so you can use any fabric or trim that you like. Measure out your first piece of trim or fabric, it just needs to match the width of your muslin. Pin in place an inch above the bottom of the muslin and stitch across the top. Take your next piece of fabric or trim and pin so that it overlaps the first piece a little bit. Continue until all that’s left is about an inch at the top for your waistband. 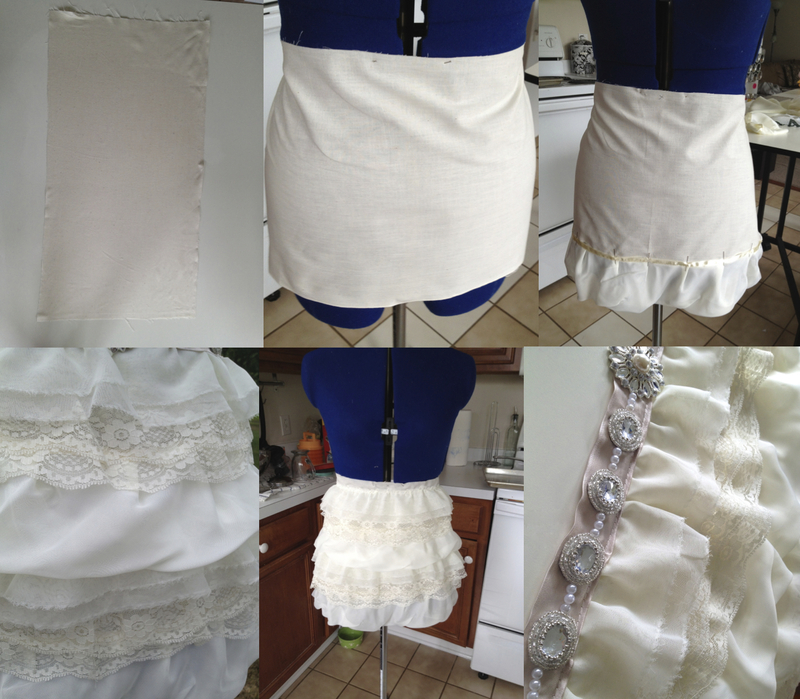 I used a pink satin and followed the pattern and sewing instructions from Simplicity’s 2592 pattern for the waistband. I then beaded eight rhinestones in the same way I made my DIY beaded sandals, but you could use pre-made embellishments from your craft store also. 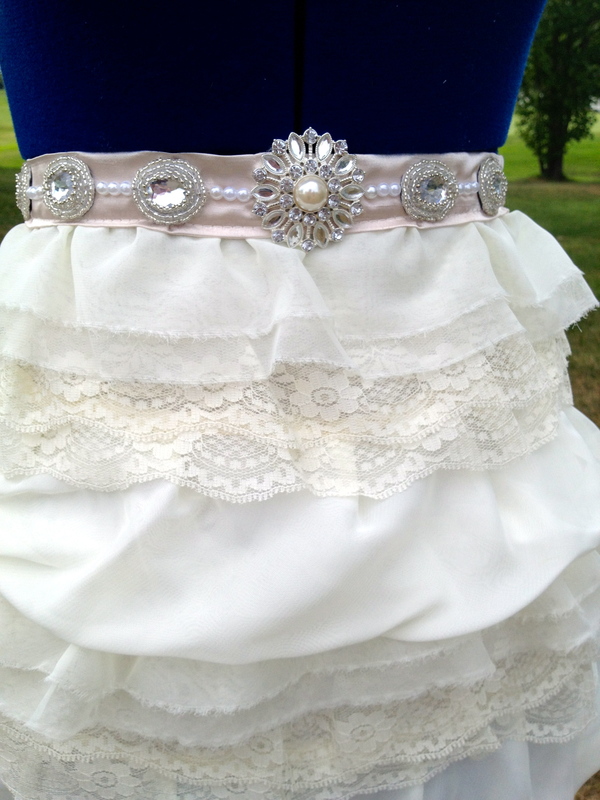 I got a rhinestone and pearl pendant from Joann’s and sewed that to the middle of the waistband. 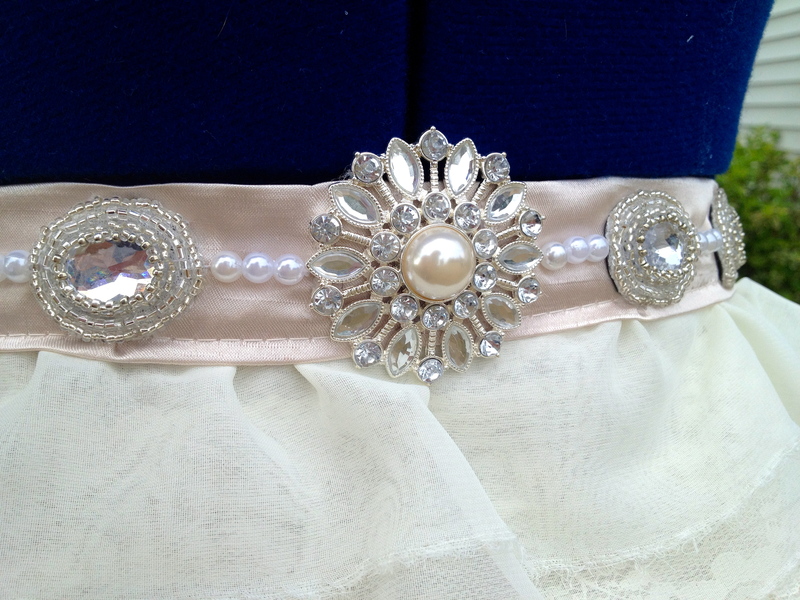 On either side, I sewed a line alternating a string of pearls and the beaded rhinestones. Be sure when sewing the embellishments on the waistband to only sew through 1 layer of the satin so the stitching won’t be visible on the back of the apron. Beautiful! I think I’d be too afraid to cook with it on, but it sure is pretty. The apron is beautiful! You’re so creative.